Wilcorp, Ontario - Bold Ventures Inc. Consisting of two contiguous properties in the McCaul Township, four patented claims and one mineral claim, located approximately 14km east of the Town of Atikokan, Ontario in the Thunder Bay Mining Division. The recently amended option agreement provides for an annual payment of $8,000 per year to explore four patented mining claims. At any time the company may exercise the option to purchase these patented claims outright for a cash payment of $100,000. Should this option be taken up the property will be subject to a 2% NSR in favour of the vendor. Half of the NSR (1%) may be purchased by Bold at any time for a cash payment of $500,000. Bold retains a right of first refusal on the remaining 1% NSR. Should Bold fail to make the optional payments described above then the four patented claims and one contiguous mineral claim,that make up the Wilcorp Gold Project, will be transferred to the vendor of the patented claims. The mineral claim is subject to a 1% NSR in favour of the vendor of that claim. 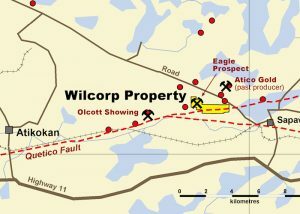 The exploration target at the Wilcorp Property is Archean lode-gold type deposits that would be related to a splay structure off the Quetico Fault Zone, a major regional structure which marks the boundary between the Wabigoon Greenstone Belt to the south and the Quetico Metasediments to the north. Known gold occurrences associated with this interpreted splay structure include the Olcott Prospect and the past producing Sapawe Gold Mine. See location map in maps charts and Geology section. 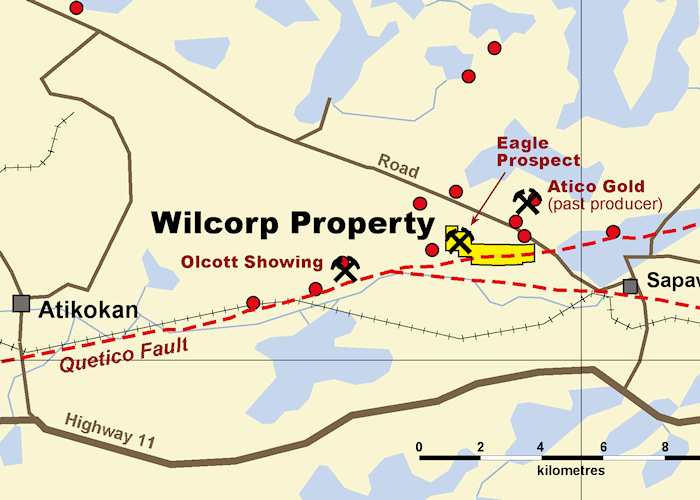 The Wilcorp Property itself hosts the Eagle Prospect in the western part of the project area which was discovered by Jack Lake Mines in 1946 and who completed 26 drill holes on the Eagle Showing. Mineralization is reported to lie within a 40 to 50 foot wide sheared diorite that has been intruded by a series of quartz-feldspar porphyry sills and dykes. Values of 11.0 gpt gold over a drilled width of 4.1 metres were reported. These assay values and widths of mineralization from previous drilling results are historically designated and unable to be substantiated. The Eagle Prospect appears to have been closed off along strike and at depth but this also remains to be confirmed. See the Eagle Prospect-IP and Prospecting Map in the maps and charts section. The 2012 IP Survey provided Bold with several untested new targets of interest near and along trend of the Eagle Prospect. A total of 14 anomalies were interpreted and recommended follow up work included prospecting on multiple anomalous zones and subsequent drill testing where indicated. In the fall of 2012 a reconnaissance prospecting program was carried out over seven top priority I.P. Anomalies as selected by Abitibi Geophysics. 62 samples were taken from different parts of the property and values ranged from <5ppb gold up to 14, 403 ppb gold (14.4 g/t gold). Of this total, 16 samples returned values greater than 100 ppb gold and six returned gold values greater than 1,000 ppb (1.0g/t gold). 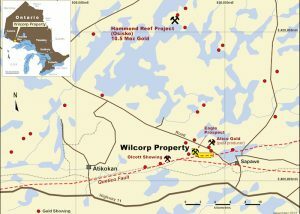 See Wilcorp Project IP-Prospecting Map that accompanies this in the charts and maps section (below). In general the prospecting was carried out in four areas: 1) the Eagle Showing Area (I.P. Anomalies MC-02 to 05 inclusive) which includes the area around the historic Eagle Showing and the area trenched/drilled by Ovalbay Geological Services Inc (“Ovalbay”) in 1994, 2) the Creek Zone (I.P. Anomalies MC-06, 07 and 13), 3) the Antler Shear Zone (MC-08 to 10) and, 4) the Eastern Targets (MC-11). 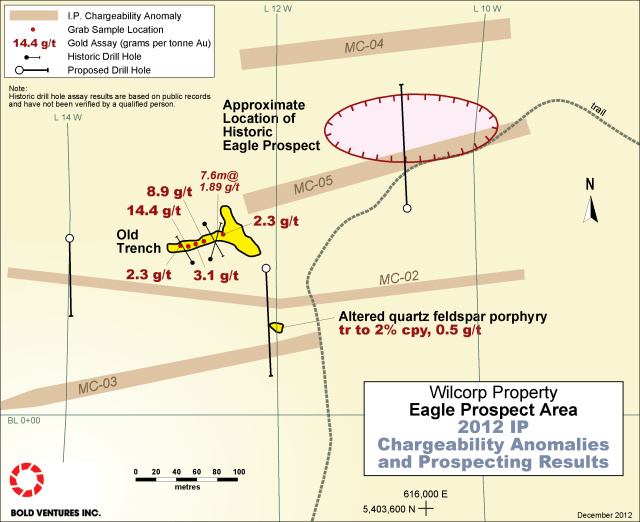 Of these four areas it was determined that three of these areas (Eagle Prospect, Antler Shear Zone, and Eastern Targets) warrant more detailed follow up work including mapping, prospecting and where indicated, diamond drill testing. While the precise location of the Eagle Prospect is not known, it is shown on the old maps as being at the junction between patented claims FF3713, 3714 and 3720. In the general area of the presumed location of the Eagle Showing, some historic trenches were located. These trenches are on strike with I.P. Anomaly MC-05 (see Eagle Prospect Area, 2012 IP map in the maps and charts section). Grab samples taken returned values of up to 14.4 gpt gold. The gold appears to be associated with arsenopyrite bearing quartz veins within narrow <1 metre wide shear(s) in diorite. OvalBay drilled several shallow holes underneath this trench in the early 1990’s, One hole (the further east drilled hole) returned 1.9 gpt Au over a drilled width of 7.6 metres. Up to five drill holes are warranted in the area around the Eagle Prospect. Anomaly MC-11 occurs near the southern property boundary and unlike the other I.P. Anomalies is associated with a resistivity low. The anomaly occurs along a creek within a distinct topographic low and is believed to be caused by a fault zone. At an old trench ~ 100 metres north of the Antler Shear Zone, two samples were taken and both returned anomalous gold values 222 and 142 ppb. Host rocks appear to be well sheared mafic volcanics with quartz carbonate veining containing pyrite and arsenopyrite. This zone may represent the strike extension of Anomaly MC-09 (see Wilcorp Project IP- Prospecting Map. Additional prospecting is recommended for this area. Anomaly MC-09 was found to occur along the chlorite-ankerite-sericite sheared contact of a granitic intrusion and mafic volcanics. One grab sample taken was anomalous in gold running 256 ppb. Additional prospecting should be carried out along anomaly MC-09 in advance of drill testing. Based on Bold’s 2012/13 work programs a recommended program of detailed mapping, prospecting and sampling should be carried out to detail and refine a follow up diamond drilling program on the top priority targets. The agreement provides for an annual payment of $8,000 per year to explore four patented mining claims. At any time the company may exercise the option to purchase these patented claims outright for a cash payment of $100,000. Should this option be taken up the property will be subject to a 2% NSR in favour of the vendor. Half of the NSR (1%) may be purchased by Bold at any time for a cash payment of $500,000. Bold retains a right of first refusal on the remaining 1% NSR. Should Bold fail to make the optional payments described above then the four patented claims and one contiguous mineral claim, that make up the Wilcorp Gold Project, will be transferred to the vendor of the patented claims. The mineral claim is subject to a 1% NSR in favour of the vendor of that claim.